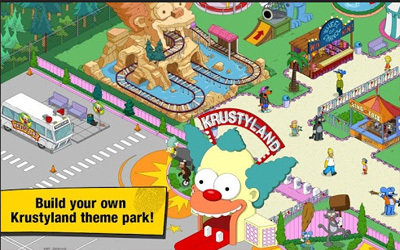 Previous version The Simpsons™: Tapped Out 4.29.1 apk for Android will help you to downgrade or install older app easily. This is one of the best Casual apps. This story line is very simple to understand too especially when you know about the movie. Homer destroys the all cities and now Homer needs to rebuild your city again. There are some steps of reconstructions that must be done but you don’t need to worry because all things are simple. You need to control some characters on this game. All characters will need to earn money and find more donuts. In order to rebuild this city, you need to buy houses, traditional shops for Springfield, offices and some other things. You also need to see all new opportunities to develop your city. There will be some rewards that you can get when you get opportunities too. You can develop your city in fast time when you use donuts. That is why you need to find more donuts and you will be able to speed up construction process for some jobs. How to earn money? You can earn money by doing some tasks. This social game is very attractive and interesting game. You can play with your friends too. Of course, Homer still is funny character that you must play in good way. In order to play this game, you need to download this game. You must provide enough space to play The Simpsons™: Tapped Out. If you use better android OS then you can play this game in easy and better way too. Been playing for over 2 years cannot get bored with all the constant updates love it.